I often wish I were a fortune teller. I think there would be times I'd really find the whole seeing-into-the-future really handy. Will I have to continue going to Amara's dance recitals or after this third year of dance she'll let the entire thing fade away? Will I satisfy my travel bug and get to see the world? Will I always have these pesty headaches? Will I ever lose the 30 pounds I gained over the last 2 years? Will I win the MegaMillions? 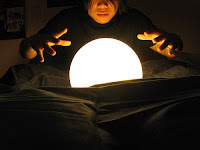 But with or without my crystal ball, I want to start this decade laced with optimism. It's no secret 2010 was a difficult year for me. We lost Lola2Amara after a courageous battle with brain cancer. So I'm thinking 2010 has to be better. Just making our faith a priority in the house. Hard work towards lowering our debt. Conscious decisions so my family eats healthier (but we are making great strides towards this!). Sleeping seven hours a night (have done this for two weeks now and am sooooo much more rested!). If I had a crystal ball, I'd just want to know that happiness is ahead for Family2Amara. How about you? Anything you want to see in my crystal ball? I'd want to know the same. And probably if I'll ever finish my baby's baby scrapbook (he's 4-1/2). Happy New Year friend! I don't set new year's resolutions. I just promise myself to be a better person. This year, I actually set one. I promised myself to stop worrying about money. So far, I am doing a crappy job keeping it. Happy New Year! Hope 2010 brings you much happiness. Jen - I'm two years (now almost three years) behind on my scrapping! Living It, Loving It - stop worrying about money?! I'd only be able to keep the resolution if I won the lottery!